Dana Point Grand Prix John Johnson Pro Mens Classic Honors a Father and Raises Mesothelioma Awareness - SoCalCycling.com - Southern California, Cycling, Cycling News, Amgen Tour of California, Bicycle Racing, Fun Rides, Cycling Event Schedules, Mountain Biking, Cyclocross, Cycling Photos, Cycling Videos, Interviews, Product Reviews. The biggest one-day criterium in the U.S. is this weekend. It’s going to be a blast, so why not sponsor the premier race of the day, the JOHN JOHNSON PRO MENS CLASSIC! Who is John Johnson, and why is he sponsoring a bike race you might be asking? John Johnson was a father of two sons, Michael and Ron Johnson, the husband of an incredible wife, Sue Johnson, and my best friend. An apple pie family that grew up doing every thing together. Most people think nothing tragic will happen to one of the parents that we grew up honoring, wanting to be like, and envisioning ourselves being the parents they are, someday. But, something did happen while my brother and I were growing up, enjoying childhood, without a care in the world. My father was being poisoned from the products he used at work to earn a living, to support his family, and provide everything that they could have wanted. Asbestos poisoning killed my father. The cancer called mesothelioma with a latency period of 20-40 years was waiting for the right opportunity to turn my family upside down. Now in our forties when my brother and I should have been giving back to my parents for all the good years, his life ended horrifically. John Johnson did not even get to enjoy his first year of retirement, play with his new grandchild, take his grandson for a bike ride, and enjoy life with our mother. My family decided along with Roger Worthington to do something about this terrible disease. We want to raise awareness about mesothelioma, and what a better way to do that than with being a part of a great event, a sport in which our father loved doing, cycling. 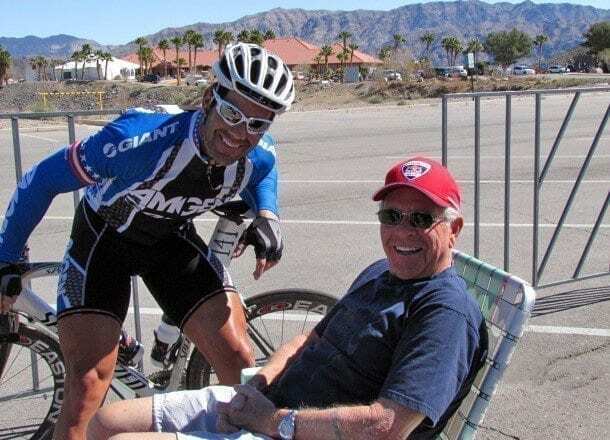 Last year I raced in my fathers honor, this year with my families support, my team, MRI Endurance.com support, the race, DPGP JOHN JOHNSON PRO MENS CLASSIC is in my fathers honor. The John Johnson Fight Meso program will continue to raise awareness about mesothelioma, continue to research and find a cure utilizing the Pacific Meso Center, and provide help to those affected by this terrible disease. We hope you can make it out this weekend for the DPGP on Sunday. Pre registration is still open to all levels, danapointgrandprix.com. It is going to be a great time. See you on the bike.